Slate/Survey Monkey political survey: Who were the best speakers in Tampa and Charlotte? 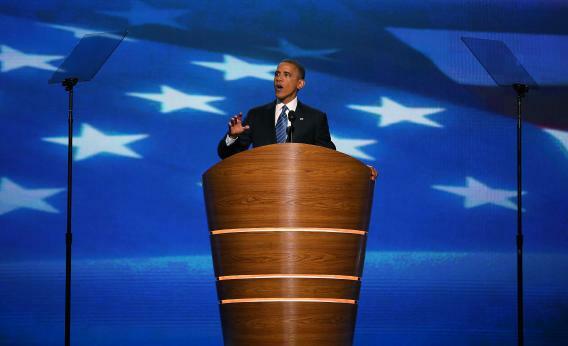 President Obama speaks at the Democratic National Convention on Thursday in Charlotte, N.C.
Photo by Tom Pennington/Getty Images. As the last pieces of confetti are vacuumed from the floor of Time Warner Arena in Charlotte, N.C., conversation will turn to what (if any) boost the convention gave Democrats. Our results indicate that the DNC left 45.1 percent of viewers far more likely to support Obama and Biden in November and 12.7 percent slightly more likely. Another 15.7 percent was unmoved by the proceedings, and around 26 percent were repelled. These numbers represent a victory over the Republicans, who in Tampa inspired only 33.9 percent of respondents to cast their ballots for Romney and Ryan. A nearly identical number, 32.8 percent, felt alienated by the proceedings. The POTUSObama led the pack with the aforementioned 58.5 percent enthusiasm rating. Next came the Cicero of the South, Bill Clinton, with 56.8 percent. Completing the Democratic sweep, Michelle Obama won 49.4 percent of respondents to her husband’s side. Among Republicans, Mitt Romney persuaded 43.4 percent of survey takers to support his candidacy. Paul Ryan charmed 42.5 percent with a gutsy blend of fact and fiction. Ann Romney loved women and snagged 41.1 percent of viewers. GOP keynote speaker Chris Christie came in last, motivating only 40.6 percent of respondents to his party’s ticket. But there was still one more question to be asked: “Who do you believe delivered the better speech—Bill Clinton or Barack Obama?” It wasn’t close. Nearly 45 percent chose Bubba, while 24.8 percent opted for Barack and 30.4 percent sat on the fence. Say what you will, but there’s still nothing like a Bill Clinton speech.